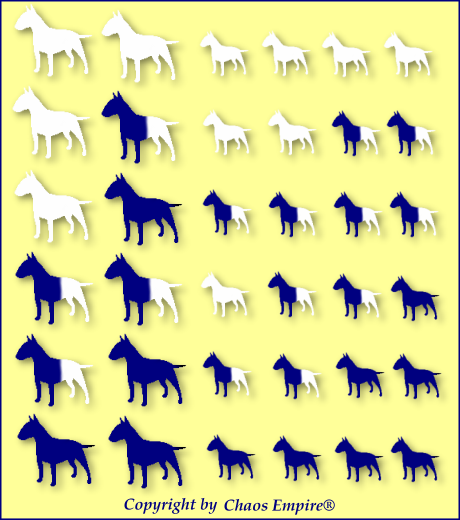 Feel free to browse all the available data around our Mini / Bull Terrier. If your dog is not listed, you find error's in the data or like to contribute your results/pedigree's send the info to jo@mbtcg.eu. Don't forget that much less Carrier / At Risk get public than Clear one's, this explains the differences in percentages of AHT/OFA and mBTcg values ! OFA now list's 3 Standard Bullterrier as AT RISK and 1 as Carrier, maybe they are wrong declared Mini's, maybe they are Mini's declared as Standard cause of their height (possible in some countries). Their names got not published.